This is a list of compositions by Giovanni Pierluigi da Palestrina, sorted by genre. The volume (given in parentheses for motets) refers to the volume of the Breitkopf & Härtel complete edition in which the work can be found. Six of the volumes of masses and some of his motets and other works were published in these editions during Palestrina's lifetime. Others were collected later, from papal choirbooks and other sources. The dates of most pieces are unknown, unless they were known to have been composed in connection with some celebration. 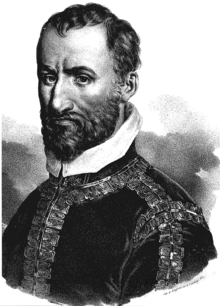 Of those works published during Palestrina's lifetime, many were composed considerably earlier that their date of publication, and of the others a large number remained unpublished until the 19th century. The 32 volumes of Palestrina's collected works were published by Breitkopf & Härtel between 1862 and 1907. The volumes of the masses maintain the order of works in the previously published volumes (with the Collected Works Vol. 10 corresponding to the first book of Masses, and so on.) Some of the pieces in the last three volumes, 30–32, are considered spurious or doubtful. Missa Petra sancta 5 19 Aeolian Parody Palestrina's madrigal "Io son ferito"
The numbers in brackets represent the volume that the work is part of. Those marked with an asterisk form a cycle of 29 settings from the Canticum Canticorum. All in Volume 25. There are 4 settings: (1) for 4 and 5 voices, (2) for 3, 4, 5, 6, and 8 voices, (3) for 3, 4, 5, and 6 voices, and (4) for 3, 4, 5, and 6 voices. There are also works ascribed to Palestrina in the archives of the Julian Chapel, from the archives of the Pontifical Chapel, from the Vatican Library, from the archives of St. John Lateran, from the archives of Santa Maria Maggiore, from the library of the Roman College, and various other collections, included in Volumes 30, 31 and 32. Many of these, however, are considered doubtful or spurious.